Forecasters expect Hurricane Matthew to gain strength as it moves through the northern Bahamas on Thursday and heads for the southeastern U.S. state of Florida. The U.S. National Hurricane Center said Matthew had sustained winds of 205 kilometers per hour Thursday morning as the center of the storm approached Andros Island and Nassau. It warned of a dangerous storm surge and the possibility of at least 20 centimeters of rain. The forecast track had Matthew going directly up the east coast of Florida on Friday after strengthening from a Category 3 to a Category 4 storm. "Get out now," Florida Governor Rick Scott told people who live along his state's coast during a news conference Wednesday. "It could be the decision between life or death." A shopper walks by the empty shelves where bottled water normally would be, at a grocery store in Hollywood, Fla., Oct. 5, 2016. Nearly 2 million people live in areas of Florida that are under voluntary or mandatory evacuation orders. Scott warned that people who were planning to leave should do so immediately, as highways are expected to be clogged with traffic as the storm edges closer. Children stand next to a flooded area after Hurricane Matthew passes Cite-Soleil in Port-au-Prince, Haiti, Oct. 5, 2016. The hurricane is reported to have killed at least 26 people in Haiti and the Dominican Republic after slamming the island as a Category 4 hurricane on Tuesday, the strongest storm to make landfall in Haiti in 52 years. U.S. Navy Admiral Kurt Tidd, commander of U.S. forces in the Caribbean, told reporters Wednesday that the United States was sending nine military helicopters in response to the Haitian government's request for help. Some of the helicopters will be equipped for search-and-rescue missions and others for transporting supplies. A Navy admiral is going to Haiti to coordinate a joint task force on storm-related relief, and between 150 and 200 military personnel are likely to travel to Haiti as well, including about 100 who will be associated with the helicopter deployments, Tidd said. He said operations would be based at Port-au-Prince airport. Haiti has postponed its presidential election, scheduled for Sunday, because many schools and churches that were to serve as polling stations are being used to shelter thousands of displaced people. Authorities in Port-au-Prince have not yet been able to assess Matthew's damage fully, because a washed-out bridge has cut off access to most affected southern areas. 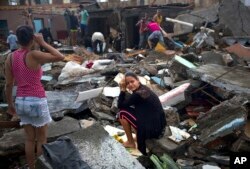 Senior government officials said they would assess the damage in person when floods receded and conditions permitted. The U.S. Agency for International Development's Dave Herman said the U.S. government was working "very diligently" with Catholic Relief Services and the Red Cross to ensure relief aid was distributed to Haiti's most vulnerable people. Jean Claude Finole, Oxfam's influence program director in Haiti, said Thursday at least 10,000 people were displaced and in need of aid. "Our first response will concentrate on saving lives by providing safe water and hygiene kits to avoid the spread of cholera," he said. In Washington, President Barack Obama urged people to help hurricane victims in Haiti by donating to the USAID Center for International Disaster Information (www.cidi.org). "Find out how you can help make life a little bit easier for those who didn't have a lot to begin with," Obama said Wednesday. 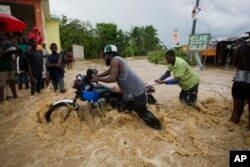 Men push a motorbike through a street flooded by a river that overflowed from heavy rains caused by Hurricane Matthew in Leogane, Haiti, Oct. 5, 2016. 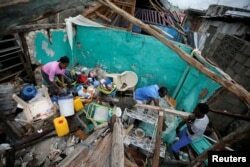 Haiti's southern disaster zone has been isolated by the loss of the bridge and a complete loss of communications networks. VOA Creole reporter Jean-Hernst Eliscar said many houses in the southern city of Les Cayes were flooded and had no roofs. Mourad Wahba, U.N. deputy special representative for Haiti, said Hurricane Matthew had caused the biggest humanitarian crisis there since the 2010 earthquake that killed more than 225,000 people. He said at least 10,000 people were in shelters. A woman cries amid the rubble of her home, destroyed by Hurricane Matthew in Baracoa, Cuba, Oct. 5, 2016. Residents work clearing a house destroyed by Hurricane Matthew in Les Cayes, Haiti, October 5, 2016. Hurricane Matthew also stormed through Cuba's sparsely populated eastern tip Tuesday night and Wednesday morning. Dozens of homes were destroyed and hundreds of others damaged in the city of Baracoa. Bus drivers with the Greenville, S.C., school district wait by their buses in the parking lot at the North Charleston Coliseum for word on when to start evacuating people to Greenville from North Charleston, S.C., Oct. 5, 2016, in advance of Hurricane Matthew. Florida and other Southeastern U.S. states were preparing for Matthew's arrival with school closures and orders to evacuate. After a briefing from the Federal Emergency Management Agency, Obama said citizens and emergency officials should "hope for the best, but we want to prepare for the worst." 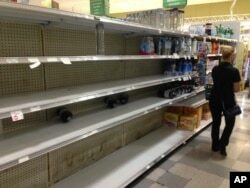 He told coastal residents, "Now is the time for you to prepare in the event you have to evacuate." Obama canceled a planned trip to Florida this week because of the storm. Florida called up 500 members of the National Guard and had 6,000 others on standby to help with search-and-rescue efforts. Georgia declared states of emergency in 13 coastal counties. South Carolina ordered a quarter-million people closest to the storm's track to leave their homes for safer locations inland and warned more than 1 million others to prepare to evacuate. Matthew is the strongest hurricane to tear through the Atlantic Ocean and Caribbean Sea since Hurricane Felix in 2007. VOA's Creole service contributed to this report.